With autumn finally here, you might be champing at the bit to get your autumn décor put up, so everyone can enjoy it. If you’re looking to spice up your home to suit this year’s trends, then you’re certainly in luck. There are a lot of frugal décor trends this year and many can be made for next to nothing. This should help you make the most out of your seasonal décor, so you can truly feel the warmth of the season. So, get out your hot glue gun and paint collection, because this season is gonging to be a lot of fun when it comes to decorating. One of this year’s hottest trends is gourds. From pumpkins to squash, decorating with colorful gourds is certain to make a bold impression in your home. You can take these decorations a lot further by purchasing artificial gourds instead of placing out fresh items. This can actually save you a lot of money as real gourds are obviously going to expire at some point. So, unless you plan on cooking your décor, you’re simply throwing away money by placing out the real thing. Pumpkins are a popular option for this décor option too. An artificial pumpkin can be used year after year, which is perfect for those that don’t want to lose an amazing design. These pumpkins can actually be carved into for a traditional look but can also be painted to add a more modern style to the home. Best of all, you can always repaint the artificial pumpkin if the design isn’t trendy or appealing in the upcoming years. Over the past few years, wreaths have been a huge holiday décor trend. It doesn’t matter what holiday, there seems to be huge wreaths to help celebrate the big occasion. Luckily, wreaths are actually very inexpensive to make, so you can create all sorts of designs to show the world you’re excited for the season. During this season, one of the major trends is to make wreaths out of dry wheat and other seasonal produce. You can purchase faux items at most hobby shops, to ensure your wreath can be stored and used again next year. In order to save money, you might start shopping clearance now, so you can purchase the ribbon you’ll need to make your wreaths. It might mean waiting to present your newest creation a full year, but it will certainly save you some major money. You might also consider selling some of your wreaths to make extra money for the holidays or more crafts. One of the largest trends this year is actually using firewood to decorate the interior or exterior of the home. These days, not as many people have working fireplaces. However, this doesn’t seem to have stopped the firewood trend from emerging. In many décor magazines, you will see firewood artfully placed in the home to add a rustic appeal to the room. Some designers are even purchasing fake wood, so they don’t have to worry about the natural breakdown of the wood. Often, the wood décor is placed in fireplaces to give the illusion of warmth in the home. Placing wood outside is also trending this year. The wood can be stacked in many ways to give your home a unique and country feel. You can also use your wood décor to improve on your Halloween decorations. Of course, you should also keep fire safety in mind when using wood as décor. Your fireplace doesn’t have to be used for fires at all. If you have a fireplace in your home, then feel free to get creative with it. This is especially true is you’ve blocked off the fireplace because it is old and inefficient. One simple way to decorate this area is to place pumpkins and other seasonal items inside of it. This creates a tidy decorative area that everyone will love. You can also place decorative storage containers in the fireplace with blankets and pillows to keep you warm during the cold season. Of course, if you really want to create warmth and comfort, then you might place some of your favorite books in the fireplace, as it will make the perfect place to display your love of reading. The interior of your home is one of the easiest places to decorate for next to nothing. In fact, one of the biggest trends this year is blankets. You can add a blanket to every chair for a cozy look that will have your guests wanting to stay for hours. One of the more popular items this season is plaid blankets, which can be purchased at a reasonable price. Best of all, this pattern comes in many colors and can be paired with just about anything. You might also consider making holiday and seasonal inspired blankets. Generally, patterns for these can be found at most hobby shops. Crocheted blankets also add a quaint and warming touch to the room. To add even more comfort, make sure you spray your blankets with deodorizer to help keep the room smelling fresh day in and day out. Pinecones tend to be in abundance during the autumn months. Whether you’re collecting them outside or purchasing them from a craft store, you should be able to make these cheap items into amazing décor during the season. One of the easiest ways to bring on the charm of pinecones is to simply place them in a bowl and put them on display. You will be surprised by how far this can take your décor. To add a bit more fun, add glitter to the pinecones or simply paint them metallic colors. Another major pinecone trend this year is transforming the items into cute animals. From owls and foxes to Halloween inspired creatures, this craft will take your décor far. Best of all, kids will love making their favorite animals and creatures. You can also make your pinecones into a classic wreath. Finally, soak your pinecones in essential oils or potpourri and enjoy a delightful scent all season. When we typically think of garland, the old school holiday tree garland that comes in vibrant colors comes to mind. However, garland has come so far over the past few years. In fact, trendy garland is often made of colorful ribbons that will truly brighten up a room. Of course, you can give your garland a simplistic appearance by making it out of paper leaves or the classic popcorn and cranberry mixture. You can hang your garland above doors, on your mantle or even on the edges of your table. This is certain to add fun to your home and is also a great craft to make with the whole family. If you want to decorate the interior of your home on the cheap, then your decorative pillows are the first place to start. You can easily transition your home to suit the season with simple pillow covers. So, stop shopping for decorative pillows which can be pricey and instead just add a cover to the pillows you already own. You can buy pillow covers, especially seasonal varieties, for very cheap. Of course, you can also make your own. To do this, simply purchase a solid colored cover, or sew your own. Then print out a design on an iron transfer and get to work. You can also use embroidery here. These items are also very easy to store and take up very little space. Candles can be one of the biggest trends for every season and never seem to go out of style. Best of all, they make your home smell amazing, in most cases anyway. One of the best ways to save money on candles is to make your own at home. You can purchase kits or follow simple tutorials online. Before you know it, you’ll be whipping out an abundance of candles to try out. Once you master making the scented wax and setting the wick, you’ll be able to work on the exterior of the candle. You can make all sorts of designs using a wide variety of crafts. For instance, you can simply paint your designs, use decoupage, or even sculpt your candles. No matter what you choose, you’re bound to have a blast while making your home look amazing. Of course, one of the easiest and cheapest ways to decorate is to put your grocery list to work. Instead of keeping your produce stored away, you should proudly display it. The gorgeous red apples and unique gourds are certain to make guests feel right at home. You can also use corn, wheat and other seasonal products to create a sense of abundance and comfort to the home. Decorating with these items can be fun too. You can keep things simple by placing them in a bowl or intricate by adding your items to a special spread. 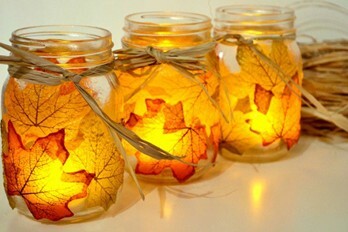 Decorating for the autumn months can be one of the easiest and cheapest things to do. These ten tips will help you keep up with trends while allowing you to show off your creativity. Before you know it, your home will look and smell amazing while your budget is still flourishing. So, make sure to have fun as you decorate this season.